Palmer came to Aston Martin after 23 years at Nissan. LONDON — The world's most contented Aston Martin customers today are Philippe and Marcus. Later this year, Richard will be similarly pleased, as will Charlotte in 2019. Why? Because they've all had cars designed around their specific lifestyle and needs. Their contentment is illusory however, as these people don't exist. They're all "archetype" customers who were dreamed up to give Aston's designers a clearer idea of who they were designing for. For example, the DB11 grand tourer was built for Londoner Philippe, a banker so confident in his demeanor he might well wear an archaic bowler hat simply for the fun of it. Philippe, Charlotte and the gang are one of many ideas Aston Martin's CEO Andy Palmer brought with him from Nissan when he joined the company in late 2014. The DB11 was his first new model as CEO. 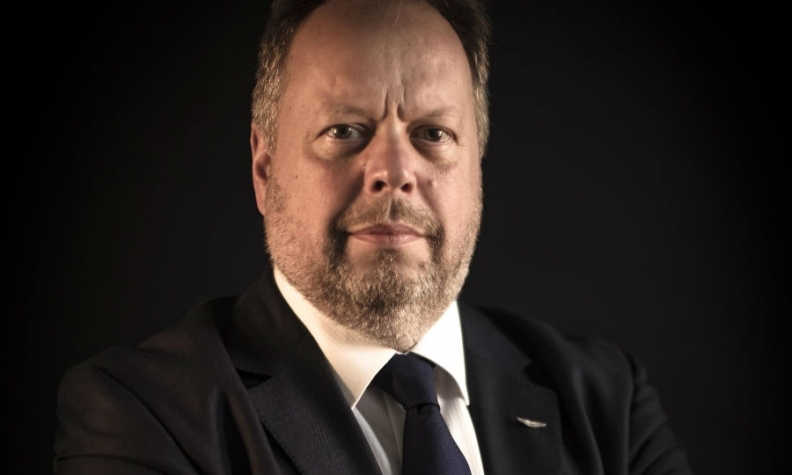 He arrived as Aston Martin was flickering back to life after one of its many hard resets, and its backers wanted an executive with the experience and vision to ensure this time the lights would stay on. Palmer, an engineer-turned-marketing guru whose raw instinct saw him promoted to Carlos Ghosn's right-hand man in his 23 years at Nissan, was that guy. Three and a half years later and Palmer has just launched his second new model, the Vantage entry sports car, from a pipeline stuffed with fresh metal. Earlier this year he was able to announce a nine-year sales high for 2017 at 5,117 cars, and his first annual profit. "He's done a solid job. He's applied his big-auto experience very well to Aston," said IHS Markit analyst Tim Urquhart. Palmer diagnosed Aston's problem fairly quickly. "It was a fantastic brand but not a fantastic business," he said in late 2015. "Basically there was no foresight beyond funding the next vehicle. That wouldn't earn enough to fund the vehicle after that and it would go into receivership." Palmer reckoned the brand went bankrupt seven times in its first 100 years, and he created a plan to prevent that in its second century. The first step was to put funding in place to launch one new model at least every year, even if that meant Aston was "geared up to its ears" in terms of debt, as CFO Mark Wilson memorably put it. But that wasn't going to be sustainable. "You don't fund car companies with debt, you fund car companies with equity," he said. So, Palmer applied lean processes to what had become a bloated organization. "It's about corporatizing this business," he said. "It's about bringing the best of large-scale OEM practices to this niche." As a brand, Aston Martin speaks of wealth and opulence, but at its headquarters in Gaydon in central England, the bean counters went to work. Palmer announced his intention for Aston to be "world-class in terms of costs." Wilson was ordered to take what he called a "good hard scrub" of SG&A (sales, general and administration) and Aston cut 295 nonmanufacturing jobs from a total workforce of 2,100. Expenses were also clamped. Flying back from the 2015 Geneva auto show, Palmer was spotted in economy class. Suppliers were scrutinized. Aston aimed to take 10 percent out of the parts bill every year, something that was common practice elsewhere. "Andy has done it in the big OEM world where there's a constant cadence of taking out fractions and fractions. If you're selling 5,000 a year, a £10 reduction per car is worth having," Wilson said. "That wasn't happening in the company before." Aston also has been pushing to find more suppliers in low-cost countries such as India and China. Investment was selective. A new sports-car platform was key, but updates to the Gaydon factory were applied cautiously. For example, there has been no big spend on robots. "We only automate what we absolutely need to automate," Aston's production director, Keith Stanton, said last year. "With other OEMs there's higher level of automation that's probably required, hence a certain amount of underutilization." However, Palmer sanctioned a new logistics center and, the big one, a new factory in Wales to build the DBX SUV arriving in 2019. Aston could have stretched capacity at Gaydon, but Palmer isn't a fan of a three-shift day. "The extra money you put in and the extra production you get out is not linear. Normally it's better to build a new factory, in my experience," he said. However, Palmer played a smart game to wring financial support from the U.K. government, who recognized the PR value of keeping Aston manufacturing in the U.K. when local investment was thin on the ground. Palmer also promised to apply "more mathematics" to the marketing ("It goes well beyond sponsoring a Bond film every three years") and diversify the customer base. He pointed out that in the first 100 years, half the 70,000 cars Aston sold in total stayed in the U.K. and only 3,500 were bought by women. Perhaps Aston's greatest asset other than the brand itself is its Daimler relationship. Daimler supplies Aston's V-8 turbocharged engine but more crucially the electrical architecture that allows a small company such as Aston to stay up to the date with infotainment, active safety and related legislation. "It's practically impossible to develop that ourselves," Palmer has said. Building this relationship was perhaps Palmer's biggest coup, says Arndt Ellinghorst, global head of automotive research for Evercore ISI. "He's keeping the brand true and honest to its core values whilst outsourcing core technologies to deliver best-in-class performance," he said. "Makes total sense to me." Aston has cut its debt from 3.8 times its earnings in 2016 to 2.1 times last year, the company announced, and is investigating whether to take ownership public via a share offering. But Aston watchers are wondering how some of Palmer's grander plans — for example, relaunching Lagonda as a standalone electric brand — can be done without a larger partner. "There are still big gaps in the strategy," IHS's Urquhart said. Palmer refutes the need for a "big brother." "With a small company you have agility and you engender creativity," he said this year. A grounding in car manufacturing is Aston's strength, Palmer says. "We know how to engineer a suspension system, a steering system, make a stiff body. That's our advantage. The bits we don't know we'll learn."